Some people spend their days thinking about how to get ahead in life. Then there are those, like Anna Maria Chávez, who focus on helping others move forward. To better understand the sacrifice given by those who served in the military, a personal experience is needed. On Saturday, people needed to hear the 21-gun salute and the sound of bugles, or see the volunteers dressed in military uniforms from various time periods at the annual wreath-laying ceremony at Finn’s Point National Cemetery. It was freezing, with snow all around and a slight fog in the air, but a personal experience is exactly what people got. 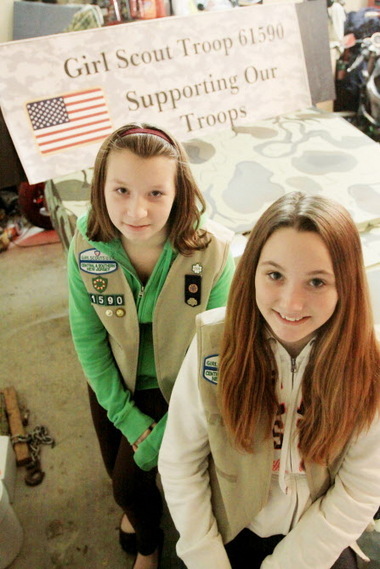 Girl Scout Troop 61590 may only have three members, but they are working to make a big impact this holiday season. For more than a month, Haley Ford, Nicole Bittmann and Syndney Coles — along with their parents — have been constructing, painting and decorating a massive float for this Saturday’s Christmas parade in Swedesboro. It's a project they hope will draw attention and donations to a cause close to their hearts.